Back in the days of the war against the United States, people built a long underground tunnel for soldiers to use. They dug it by hand and it went on for 32 kilometres, from village to village. Today it is a very interesting place for tourists to visit. What makes it even more interesting is that people who remember it back in the war days are around to tell tourists about it. Ky Anh guerrilla warfare tunnel in Quang Nam Province was one of three tunnels that played an important role in the war against the Americans between 1965-72, along with Vinh Moc in Quang Tri Province and the Cu Chi tunnel in suburban HCM City. Today, Quang Nam is embarking on a project to establish the tunnel as a tourist destination. Situated in Tam Thang Commune, 7km northeast of the provincial capital Tam Ky, the 32km tunnel served as a shelter, logistics and military command base for nearly 1,000 soldiers and guerrillas between 1965 and 1975. In 1997, the province restored two main sections of the tunnel in Thach Tan Village that were recognised as a national historic relic. Over 4,000 visitors a year now visit the site. For locals, the tunnel serves as a reminder of a hard-won victory. Huynh Kim Ta, 56, who now guides visitors through the tunnel, recalls digging the Thach Tan section as a teenager in 1964. Ta protected the area as a scout during the war along with his family. His father was killed in the tunnel during a raid by the Sai Gon army and the US force in 1965, before the tunnel was completed, while his brother died in the resistance against the enemies' "mopping-up" attacks. "My village, home to 600, was liberated in 1964, but we had to deal with weekly attacks from the Sai Gon regime force and US troops and daily shelling from a military base 2km away," Ta said. At that time, people in Ky Anh Commune (now called Tam Thang) started digging by hands the 32km tunnel network, which zigzagged among all villages in the region. It took two years to complete the defence work, which is 1m wide and 1.5m high. Thach Tan and Vinh Binh villagers covered the two longest segments with total lengths of 10m each. Thach Tan served as headquarters for the local militia. Under the communal house lay an entrance, warehouse and meeting room. The entrance also led to the nearby command headquarters' tunnel. Villagers had to dig deep through layers of sand and laterite in order to prevent the tunnel arch from breaking under shelling or the weight of military vehicles. So that they would not be observed by the enemy force, they had to excavate the ground at night and dump the soil into a river or rice fields. As the commune was surrounded by bamboo bushes, the tunnel system was built under bamboo trees, while entrances and exits were disguised by sand and bushes. "The whole village kept the tunnel a secret. That's how it survived during the 10-year period of fierce war," the former guerrilla said. Visitors start the tour at the 300-year-old communal house, the starting point of the tunnel system. For many, it makes a strong impression. "It's the first time I have visited such a tunnel. It's a great place for the young generation to learn about how hard their predecessors fought for the country's peace and reunification," said Doan Minh Tri, 30, from Da Nang. "I wonder how it was kept secret and protected from enemy shellings over a decade of war." Tour guide Ta explained that all villagers, from the elderly to small children, were repeatedly reminded of the importance of keeping the tunnel top secret. It was also regularly guarded by local people. "The guard tower was a big tree near an entrance. Local people kept watch over all enemy's operations a few kilometres away," he explained. In addition, ventilation systems and medical services were built in many places in the tunnel so local militia and liberation forces could survive inside for long periods of time. 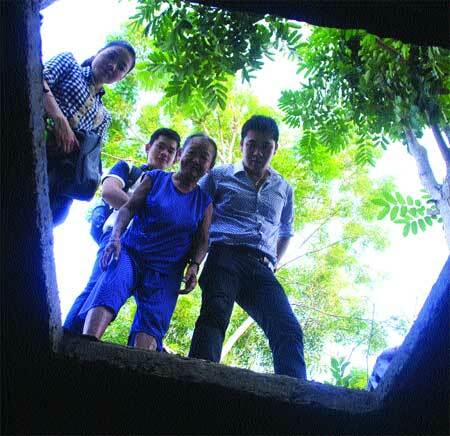 Nguyen Thi Bong, 74, said an entrance to the tunnel was built in her garden in Thach Tan Village and her family was assigned to protect it. She was a messenger for militia, while her mother was a cook and nurse for people in the tunnels. One day in 1968, the entrance was discovered by the Sai Gon regime troops. "They burnt my house and forced my father and me to call militiamen for surrender. Their torture lasted seven hours, but they failed," she recalled. The Sai Gon soldiers eventually pushed the two down to the tunnel before launching grenades to kill them. "We did not die, but the entrance and a section of the tunnel were damaged. A statue was built to record the story of our courage," she said. Her father died from dengue fever in the tunnel later that year, while her younger sister and older brother, who joined the communal guerrilla team, sacrificed their lives in battle. Her mother died from old age and serious illness after liberation. Today, she lives in a house built with financial support from the commune and businesses near the old entrance of the tunnel. "The old entrance is now in the backyard of a household in the village. After the raid in 1968, we moved and the image of the tunnel entrance is now only in my mind," the woman said. At an entrance of the old tunnel restored a few years ago, visitors can hear her recount the story of what happened 46 years ago. However, the restoration work is still in progress. While the area under the floor of the communal house was very large and comfortable, visitor Tri said the tunnel section near the channel was "tough" to manoeuver. "The tunnel, infrastructure and reception should be upgraded to create more convenient conditions for visitors. It would also be nice if there were a bathroom and information centre," he suggested. Chu Quang Ngan, director of the centre, said the tunnel only had enough funds to restore a few main sections. "More funds should be invested in building infrastructure and fixing tunnel sections that have collapsed because of time and weather," Ngan said. Scheduled to be completed in 2025, the province's project will restore the tunnel network in addition to building a tourism centre and related infrastructure and establishing the Dam River as an eco-tourism site. Ngan hopes that turning the tunnel into a tourist destination will raise the living standards of local people. Although the war ended nearly 40 years ago, villagers still live in poverty. Thach Tan Village has 200ha of rice paddy, but sand terrain can only produce 5 tonnes per hectare, resulting in income per capita of VND10 million a year. Guide Ta provides for his family by farming, masonry and working as a guide at the tunnel. For the latter, he receives a monthly allowance of VND1.5 million. .Guerrilla warfare happens when a small, community force fights against a big, organised army. To restore something that is broken means to fix it up and make it look how it was when it worked. An historical relic is something that is manmade and has historic value. A teenager is someone aged between 13 and 19. A scout is someone who goes out and sees what is going on and then reports his findings to headquarters. To be liberated means to be freed. When you have to deal with shelling, you have to live with exploding rockets being sent to you from an enemy. Thach Tan served as headquarters for the local militia. Militias are made up of people who form an army group but are not trained soldiers. Under the communal house lay an entrance, warehouse and meeting room. A communal house is one that is used by many people, or a community, rather than by one particular family. Villagers had to dig deep through layers of sand and laterite in order to prevent the tunnel arch from breaking under shelling or the weight of military vehicles. Laterite is a type of clay that is found in the soil. So that they would not be observed by the enemy force, they had to excavate the ground at night and dump the soil into a river or rice fields. To excavate means to dig out. As the commune was surrounded by bamboo bushes, the tunnel system was built under bamboo trees, while entrances and exits were disguised by sand and bushes. When something is disguised it is made to look like something else. A former guerrilla is someone who was once a guerrilla but is no longer. Your predecessors are people who were around before you. Reunification means coming together to be one, once again. Ventilation systems are systems that are put in place to allow fresh air to come in and out. "They burnt my house and forced my father and me to call militiamen for surrender." To surrender means to give up. Her father died from dengue fever in the tunnel later that year, while her younger sister and older brother, who joined the communal guerrilla team, sacrificed their lives in battle. Dengue fever is a horrible disease that people catch after they are bitten by mosquitoes. To sacrifice your life for your country means to die for your country, as soldiers do during war. Financial support means help in the form of money. "After the raid in 1968, we moved and the image of the tunnel entrance is now only in my mind," the woman said. An image of the tunnel entrance is a picture of it. To manoeuver means to move in a carefully planned way. "The tunnel, infrastructure and reception should be upgraded to create more convenient conditions for visitors. The infrastructure of the tunnel is its entrances, ventilation system, passageways and other parts of it that are important to making it a successful tunnel. Eco-tourism is tourism that is to do with nature. A destination is a place you travel to. Poverty is a state of being very poor. Thach Tan Village has 200ha of rice paddy, but sand terrain can only produce 5 tonnes per ha, resulting in income per capita of VND10 million a year. A paddy is a rice field. The terrain is the countryside. Income per capita is the amount of money each person in a community earns, on average. Guide Ta provides for his family by farming, masonry and working as a guide at the tunnel. For the latter, he receives a monthly allowance of VND1.5 million. When two or more things are written, or said, the first is called the former and the last is called the latter. In this case, "working as a guide" is the latter. 1. A type of warfare. 3. Somebody aged between 13 and 19. 4. Something found in soil. 1. Guerrilla; 2. Paddy; 3. Teenager; 4. Laterite; 5. Decade.